How Did the Patreon Pledge Drive Do? Last week I ran a pledge drive for Patreon. If you don’t know what Patreon is, that’s ok: Patreon is an online subscription service that lets you support your favorite artists, often for as little as $1 a month. and the upcoming The Legend of Jamie Roberts. 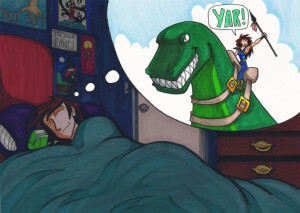 There’s a separate Patreon page for Validation and its related stories (including Mr. Dino & Friends, Roxie Comics, and Tiny Unicorn). That’s because the Validation comics are a collaborative effort with Christian Beranek and myself. Funding for my Fantasyville Productions comics does not go to Validation, and Validation funding does not go to Fantasyville Productions comics. I ran the Patreon pledge drive for my page (not Validation’s) because the comic shop I currently work at has cut my hours severely. Like, now I only work there 5 hours a week. So I ran the Patreon pledge drive to see if a) I could get new patrons to b) help cover the lost income due to my hours getting cut. The goal was to jump from $180 a month to $250 a month. My goal for the end of the year is to make $500 a month on Patreon alone, so to get to $250 by the half-year point would have gotten me closer to this goal. By the end of the week, we went from $170 a month to $201 a month. It didn’t make my goal, but it’s still not bad at all, especially for only having a pledge drive that lasted a week. What surprised me more was the current patrons I had who increased their pledges – often by an extra $3 a month! That’s amazing! We also got a new patron on board, which is marvelous, and so immensely helpful. And so, with the combination of the new patron plus the increased pledges from current ones, we reached one of the Patreon goals listed on the page: at $200/month, I’m now going to draw a patron-exclusive The Case of the Wendigo desktop wallpaper! Honestly, it’s just amazing that folks who love my comics were willing and able to chip in and help during this tough time. This will help make production of The Legend of Jamie Roberts go just that little bit smoother. If you would like to pledge support, and help bring The Legend of Jamie Roberts to life, please check out my Patreon page. You can adjust or cancel your pledge at any time. Even if you pledge $1 a month, you get to see behind-the-scenes development of the comics I do. 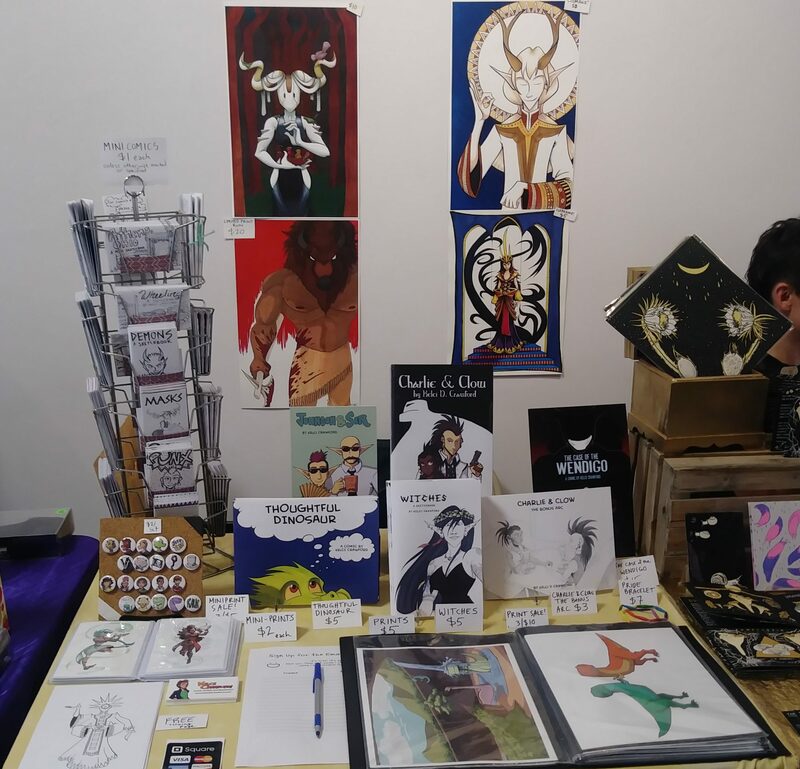 For example, here’s a post about Jamie and their two best friends; here’s another post about the dragon Norsa; and here’s a post about two gods in the Jamie Roberts universe, The Voice and The Messenger. These three posts were made free during the pledge drive, to give a taste of what rewards patrons can get for pledging support. If you’re broke, that’s totally ok, because Patreon is optional. If you would rather make a one-time donation, there’s a Paypal donate button on the side of this website, or you can purchase a convention goody from my online store. 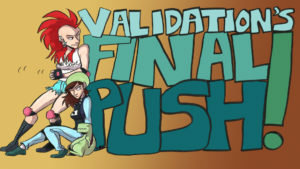 Those of you who are on my email newsletter, as well as on Facebook and Tumblr, know that Validation’s Final Push launched June 1st. This KickStarter campaign launched to get funding to help Christian and me make the final pages of the webcomic Validation. Christian has been paying me out of her own pocket to make comics every week for the last 5 years. The Patreon has helped give Christian a small writing stipend, but it’s not enough to cover the full cost of this comic (from paying me, to web hosting, etc.). So, we started the KickStarter campaign to get us over the edge. And over the edge we went! Because holy dang, our initial asking goal was $500 and you met that goal within 2 HOURS of launch! We made our first stretch goal of $1000 before the weekend started! As I’m writing this, we’re right on the cusp of making the $1500 stretch goal! I think it helps that the rewards are fun. At least two of them include getting drawn in one of the final pages of Validation! This baby has been out of print for quite some time. But now it’s available for KickStarter backers as a reward. If you’re interested in helping this KickStarter camaign, there’s still time to pledge. Who knows? Maybe you’ll be the one who helps us reach that next stretch goal! If you’re broke, please share this campaign with your friends. Every share helps more than you know. The campaign ends MONDAY, JUNE 11.